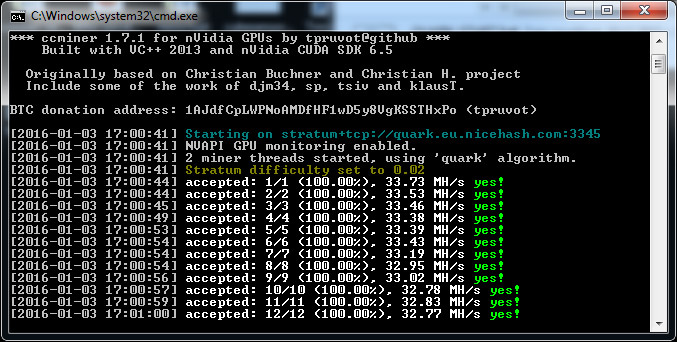 New year and a new update in the form of a freshly compiled Windows binary from the latest ccminer 1.7.1-dev (source). The latest updates include some small bug fixes as well as the addition of the GPU mining support for the sib algorithm (X11 + Russian Streebog-512/GOST). The tpruvot fork of ccMiner is compatible with older Nvidia GPUs, so this is the version to go for if you have older video card that you want to try mining cryptocurrencies with. This Windows binary is compiled with VS2013 and CUDA 6.5 and supports Compute 2.1, 3.0, 5.0 and 5.2 GPUs, however have in mind that not all of the supported algorithms may work on older Compute 2.1/3.0 GPUs, but you can at least try with it.